Install the Web Developer Toolbar from the Firefox add-ons website at https://addons.mozilla.org. Open the website you want to check in Firefox. 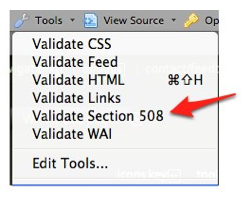 On the Web Developer Toolbar, select Tools, Section 508. You will then see a full report of your site’s Section 508 compliance as determined by the Cynthia Says service. 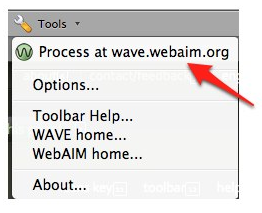 Install the WAVE toolbar by visiting https://wave.webaim.org with your Firefox web browser. Once the toolbar is installed, visit the website you want to check with Firefox and select Tools, Process with wave.webaim.org. Your website will open with embedded icons that will point out accessibility errors and accessibility features.To learn more about the icons, choose icons key at the top of the screen and then click on any icon to get a more detailed explanation of the accessibility problem or feature it describes.